Most contact centers don’t have a great business case. This is mainly due to a few faulty assumptions. There is a widespread pre-conception that customer service/support can’t be profitable. This is wrong. There’s also a belief that you shouldn’t do sales through customer service, if it’s f.eg. technical support. This is also wrong. There’s also a strong belief (stemming from the 80’s) that you can’t do both service and sales at the same time. This is so wrong that it baffles the mind. Especially with today’s view on business. But this is not why most contact centers fail to make a profit. It’s simply that no one thinks it can be done, which means that no one tries. I can give countless examples of extremely profitable contact centers. Most insurance companies, banks and card providers have profitable contact centers. There are several e-tailers and telco providers that do it, but you’ll also find it in media and publishing. It all comes down to the initial business case. Most companies haven’t developed a business case for their contact center. For me this is quite bizarre, considering that even in traditional industries their customer support/service cost as ratio to their revenue is 10-20% of each order. There is a huge potential for both increased revenues and increased efficiency. In other articles we’ve shown how to increase profitability through working with specific phenomena such as increased FCR/quality, lower contact debt (better real-time management) and other measures. Our strongest recommendation is however to start with a professional business case, as one would with any department within an organization. This will determine whether your contact center will be a cost center – or ultimately a profit center. Problems with long response time? Long response times in customer service. A problem – not a challenge. A problem can be fixed quite quickly. A challenge can be worked with over time. Many companies suffers from long response times in their customer service / support. Mainly caused by three different causes. Read more about those three – and how to fix the problems quickly with help from our calculating tool. Has your response time increased rapidly in a short period of time? Then you’re probably suffering from what’s called a contact debt. A contact debt can give serious repercussions on your entire business but can be fixed quite quickly. In only 48-96 hours. We’ve written a detailed article about the issue which you can find here. As a senior manager you’re used to working all the time that you’re paid for (and maybe more time on top of that). If you work in an inbound contact center you’re reactive and you can only work when someone actually tries to contact you. First, you need to identify which of the reasons listed above you’re suffering from. Sometimes (rarely) it’s a question of understaffing and a true capacity problem. Mostly it’s a combination of all three. This is a problem – which means it can be fixed! Use our calculator to get a hint of your problem. From contact debt to a happy customer. Contact debt is a phenomenon that quickly can crush even the most well-run contact center. It usually only happens for organizations where the customer must reach an agent like banks, hospitals, taxi/transportation etc. The likelihood it’s time sensitive and/or carries a lot of value for the customer. It’s main driving factor is the response time and call back functionality makes it worse. If your customer can’t reach you within (for them) an acceptable timeframe, they will abandon their attempt to contact you for a short time. They will then either try through other channels (e-mail, chat, phone) or wait for a short while before trying again through the same channel. If you don’t respond to a query, you have a debt to that contact (mission incomplete). The sum of your contact debt is the number of contacts that have a need to reach you, but failed when trying to. For most businesses/organizations, a repeated failure to meet the need means that you’ve lost the customer or their loyalty. That means that the negative debt cycle at least doesn’t increase in all perpetuity. For other organizations (like banks, hospitals, taxi/transportation) their need can only be fulfilled by the original provider (if my flight is cancelled, I still need to talk to my airline if I’m ever going to leave the airport). This means that I will continuously try to contact my provider until my need is fulfilled. The contact debt hence grows and spirals out of control until you’ve met the entire need. The real issue is that when you’re in a que, you will wait for some time (highly individual) and take up a place in that que. If I’m behind you and 100 others in that que, I will get demoralized not only because of the length of the que, but from the simple fact that they will handle your issue before mine. This increases the likelihood that I will leave the que. Because in a contact center, I can’t see how quickly the line is moving, and the message of expected waiting times is calculated by the number in the que in front of me (which is a lot). If people drop off, I won’t see it directly, which increases the likelihood of me dropping off and by that continuously increasing the contact debt and a negative, downwards spiral. By phone, most contact centers use call-back functionality to mitigate longer response times. Call-back is also a feature that most customers appreciations. However – what most operational managers miss, is that it’s never 100% certain that the call-back is answered. That’s especially true if the time exceeds 10 minutes between the choice to utilize call-back and the actual call-back. Then the response rate can drop as low as 50%. 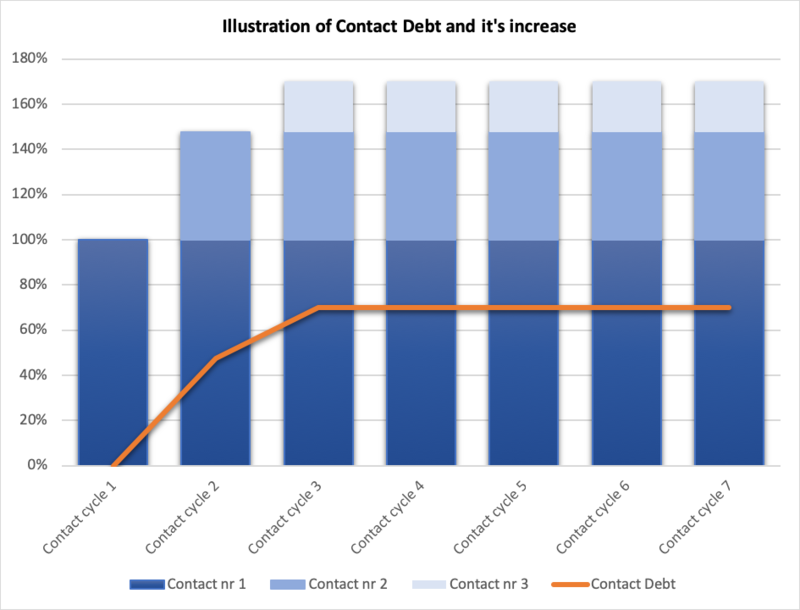 In below example you can see data from a customer case that experienced the contact debt phenomenon. In this case a customer on average stopped trying after 3 attempts (contact cycles) and at least the debt wasn’t growing. They still had a 70% increase in call volume over the course of 3 days! No organization has the flexibility to counter such an increase. The driver behind this was the fact that only 60% of the call-backs were answered. This increases the que by 32% (if 80% chooses the call-back option) per contact cycle. Adding other factors (like abandon rate, multiple channel contact etc. ), you will have the perfect storm coming up. Considering that you have the same staff and already a problem with waiting times, you’ve started a negative spiral that transfers between 35-40% of the day’s or shift’s volume to the next day/shift. Luckily, a contact debt is a false need. The staff hours needed to resolve the issues are still the same because you haven’t increased the number of issues by 75%. Only the number of contact attempts. Your only focus should be to cut response times and increase your solution rate so that the contact cycle negative spiral stops. Turn off the call-back feature! Yes, you will give lousy service and forcing your customer to wait during the time when you’re doing it. You can turn it back on once the contact debt is fixed. Find every single resource that you can possibly use! For 48 hours, don’t staff the other channels and utilize every single resource to fix the most urgent channel first (where the customer expects the quickest response which is usually phone or chat). Turn off other channels that are not critical e.g. social media and chat! Yes, you will take a hit in CSAT and NPS and receive complaints, but it can’t be worse than the contact debt. Utilize every possible staff hour to fix response times! Cancel all internal meetings, training, if possible approved leave etc. Remember that this takes place in real time and every contact solved, pays off the contact debt. Think of this as a football game that needs to be won. There will be a fallout with this tactic – but the alternative is much worse for your customer, your brand and the long term strategy of all you want to accomplish. Silos and multiple tiers are killing customer service. Everyone agree with the fact that skills are essential and that some people are better than others in different disciplines. We must however challenge the preconception that talented people can’t be multi-skilled to a “good-enough” level to solve customers problems. Studies shows that 80% of all customer issues are resolved by self-service options. However 50% of the customers are still contacting the customer service. With the high rate of self-service options the issues facing today’s customer service reps are more complex and span over a wide range of disciplines. A payment issue might include technical problems at the same time as it has administrative factors coupled with an opportunity for revenue or anti-churn. If we organize our contact centers and service offerings in silos and multiple tiers, we don’t prepare our employees for handling cross-functional and complex issues. We have made it impossible to meet the customer’s needs in the initial contact, with the same person – effectively killing customer effort score. The latter also happens to be the biggest driver behind the NPS (net promoter score) and CSAT (customer satisfaction score). With silos and multiple tiers (second and third lines) – you create unnecessary (almost exponential) complexity in the operations model since you need to forecast and staff each silo and tier separately. Some might argue that it’s expensive to train multi-skilled staff and nearly impossible to recruit them from the beginning. This mindset sets the potential bar for quality from the start and will increase costs by 40 – 50%, considering repeat contacts and low first contact resolution rate. The organizational and operational structure of the contact center will determine the customers’ experienced quality (customer experience) and ultimately the running costs. For high-growth companies – unnecessary complexity in the operations creates bottlenecks that are difficult to overcome. Real time proactivity – the underutilized operational potential. By restructuring and removing silos and tiers within the service organization – you unlock an unprecedented operational potential. Considering that customer contacts are cyclical in real time, which most operational reports don’t consider, (most operational managers analyze average metrics over longer time periods f.eg. daily or weekly statistics), you can create a proactive environment when the inbound volume are lower to further prevent reactive inbound contacts. Our studies from 20+ customer cases show that unseen potential reaches up to 20% of the staffed time. Considering that it’s already a sunk cost due to the need to staff all open hours, utilizing down time for proactive contacts will always be something value adding if it’s done right. What effect could a proactive contact have for your customers service experience? Real time proactivity is a real possibility if your contact center is inhouse and you’ve achieved a high external first contact resolution. Your customers want their needs met. It’s as simple as that. That will drive satisfaction, decrease the risk of loyalty loss and increase the customer experience scores more than exceeding a customer’s expectations. As an effect of increased digitalization, self-service tools and in general a better understanding for the customer’s needs (most order their plane tickets online and not with a physical agent), the complexity of problems that customers can’t solve by themselves, is much greater than before. This development means that many organizations are unable to solve a customer’s problem in the initial contact when reaching out to a live agent. This article describes why increasing quality and case resolution (as well as pre-empting downstream contacts) leads to substantial positive effect on any organizations bottom line and still is the biggest factor for a customer when scoring their customer experience. First Contact Resolution is a popular metric used throughout the contact center industry. It’s simply whether the customer’s issue was fully resolved in the initial contact (regardless of channel type e.g. phone, e-mail, chat etc.). There is however a significant difference whether you measure if the company means it’s resolved (internal First Contact Resolution rate), or if the customer perceives/feels the issue is resolved (external First Contact Resolution rate). Most companies measure the internal resolution rate, but don’t ask their customers how they experienced it. In this article – we’ll discuss the external FCR which significantly affects the number of contacts that your contact center will receive (your volume) throughout all your channels. The internal FCR is globally measured somewhere around 70% – which means that 30% of the customers will contact you again through the same or different channels. The external FCR is by several studies from well reputed research institutes ranging between 32-45%. That means that somewhere between 55-68% of the total contact volume globally is completely unnecessary and could have been addressed in the initial contact. Considering that the staffing costs (and other associated costs e.g. office, management, software licenses etc.) is 80-85% of the entire cost volume it suggests that (at least on a theoretical level) that you can cut between 44 – 57% of your entire cost volume if you increase your external FCR to 100%. Going from theory into actual implementation/change – the results (in our customer cases) are within 90% of the theoretical estimation. It might sound like common sense, but high-quality customer service is just to meet the current and short-term needs of a customer. It can range from securing a payment plan (if the customer can’t pay) to changing the shipping address of a product. If the need is resolved, the customer will in most cases be satisfied. To do this, the quality of the actual customer dialogue is critical considering that it’s not the resolution itself that reduces contact volumes – it’s if the customer believes/feels that it’s been resolved (it’s still of course important to actually resolve it) and trusts the agent. This will mainly be decided on how the resolution is delivered (the way an agent communicates with your customer). If you break down the different issues that arise within your offering there are four different steps that need to be fulfilled for the agent to theoretically and practically be able to resolve the issue. Knowledge – does the agent have the theoretical training to resolve all steps of the case? Empowerment – is the agent allowed to resolve all steps of the case? Skillset & tools – is it possible to resolve all steps of the case within the first contact? Execution – is the agent assigned/directed to do it? Surprisingly, in many organizations (especially larger ones), the majority of cases handled fail in one or more of the above common-sense steps. At the end – quality is the sum of how well all steps are performed in each dialogue. A downstream issue is a problem/question that arises as a natural part of the products or service complexity but can be foreseen and prevented by minimal effort in the initial contact. It’s about creating customer question flows based on common sense and figuring out corresponding actions by using common sense logic. Example: If you’ve purchased clothes with your credit card online and you want to return the order you might need to contact the customer service department for clear instructions. Then it will be a logistical question (how do I send it back and how should I package it). But there will also be a payment question that might arise downstream (when will you refund my money?). This is usually not within the control of the store but the credit card providers different policies and routines. If the agent is aware of the major credit card companies refund routines they can inform the customer of this and thus preventing a potential contact. This is how customer insights and deep process/product knowledge can prevent unnecessary interactions.